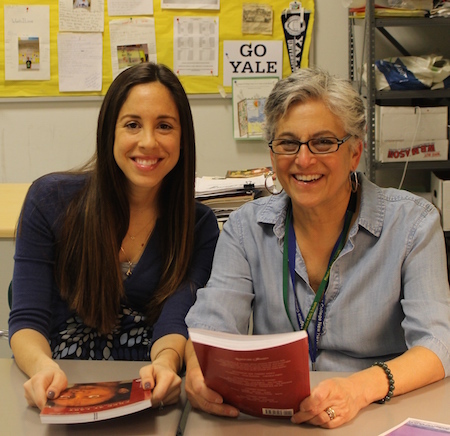 Great Books teachers Judith Donroe and Elizabeth Tremper at Hamden Middle School. Common Core has opened a path to thinking and learning that calls for change in the way teachers teach. But how does a teacher change her practice to reflect that call? How does an idea become a best practice? And finally, how does a school take that practice and make it its own? Our school, Hamden Middle School in Hamden, Connecticut, is a reflection of our town with many different nationalities, religions, languages, abilities and socio-economic levels. Our teachers are skilled professionals who can navigate the roadblocks of teaching to the adolescent mind. They know how to work with a curriculum and adapt it to the individual and group needs of their students. They are willing to share with each other and test new waters. They are . . . teachers. Change happens slowly. For change to hold fast, one must have a solid base. 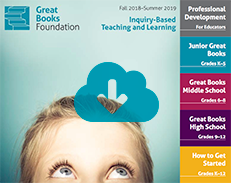 Our base, at Hamden Middle School, was the Great Books model of Shared Inquiry. As the reading consultant for seventh grade, I consult with staff and teach four reading classes. These two roles allow me to teach, mentor, model and co-teach with validity and fidelity. Three years ago I brought the Great Books model to two seventh grade English classes. I found that the program I had been trained in 20 years earlier was as solid and well-received in 2013 as it was in 1994. The teachers liked it and students progressed in their ability to read and discuss high-level text questions. We then brought the Great Books model to other seventh grade English teachers. Our schoolwide goal in 2014-15 was to focus on main idea and theme. Teachers developed interpretive questions for each reading selection and students wrote short essays on theme to close each lesson. That year, seventh-grade students exceeded goal on our schoolwide assessment. We believed that our use of the Great Books Shared Inquiry method was influential in making goal. This year (2015-16) we decided to focus our Great Books model more intensely on student collaboration and independence. The Shared Inquiry model reflects a move from a teacher-led classroom to a student-centered classroom. One of our English teachers became a mentor teacher, helping other interested teachers learn the method through co-teaching and in team meetings. Over time, teachers observed that student questions improved so much that they were on par with teacher-generated questions. Today, if you walk into a seventh grade English class at Hamden Middle School, you may see small groups of young adolescents, pencils in hand, highlighting and annotating text. Perhaps they are discussing questions they wrote, or aspects of stories they didn’t understand, and they are asking their peers for guidance. Perhaps they are sitting in one big circle discussing a focus question generated by the group the day before. The room is buzzing—independence and collaboration define the learning. areas. We used $600 in seed money from the Connecticut Association of Reading Research (CARR) to help purchase Great Books/Perfection Learning texts. We opened walls and co-taught classes. 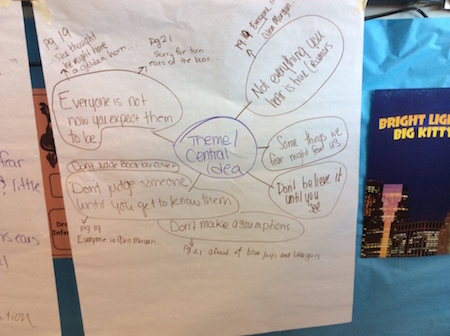 A chart from one of Hamden’s classes used to brainstorm the theme of “Boar Out There,” by Cynthia Rylant. In our first collaboration with social studies, students read a nonfiction piece about Otzi, the Iceman (the well preserved 5,000-year-old mummy found frozen in the Italian Alps in 1991) and compared it to the short story, “The Treasure of Lemon Brown” by Walter Dean Myers. Our science/English collaboration was embedded in the unit on weather. Students read Into Thin Air by Jon Krakauer and Mark Pfetzer’s My Everest Story (as told to Jack Galvin). They learned about weather conditions on Mt. Everest and the effects of high altitude on the body. Then classes skyped with Mark Pfetzer. Student-generated questions included: “How were you able to talk your parents into letting you climb when you were only fifteen years old?” Science, social studies, and English teachers worked together to bring units alive using the shared inquiry model. There’s no shortage of teaching strategies—just try googling the phrase. But what makes a strategy a practice? And how does that practice become internalized and embedded so that it becomes a best practice? It happens when teachers are given opportunities to try out new ideas. It happens when teachers find a practice they know works to improve learning. Change happens when teachers open their doors, when teachers model and co-teach, when they prepare lessons and modify them together. It happens when someone sees value in a practice and can back it up with monies. Change starts small. It takes patience. It knows that each class has its own climate and it acknowledges and bows to that. It takes a cadre of teachers willing to try. It’s planted and nourished and finally flourishes. And that is how an idea becomes a best practice. Talk About It! Helping Students Think and Write about Nonfiction Texts →← Beverly Cleary Turns 100!